I arrived at my Airbnb a little before 9:00 last night. It was already dark. After I got settled, I decided to take a walk to the center to see if I could get some food. I hadn’t eaten much all day and I was hungry. Did I mention it was dark? Also, did I mention that all the streets in Tepoztlan are cobblestone? Except not really. They are random‐sized stones. And did I mention I sprained my ankle recently? I’m setting the stage for an epic fail, but wondrously, I made it to the center unscathed. A few of the downhills were rather steep, and it was very hard to see. I used the flashlight on my phone, but even so, this is not an easy city for walking in any light and on any slope and with the healthiest of ankles. I expected to arrive at a quiet city center, it being past 9:00 now. What a delight it was, though, to arrive at the zócalo, the main square. It was bustling with market activity. Music came from all directions. 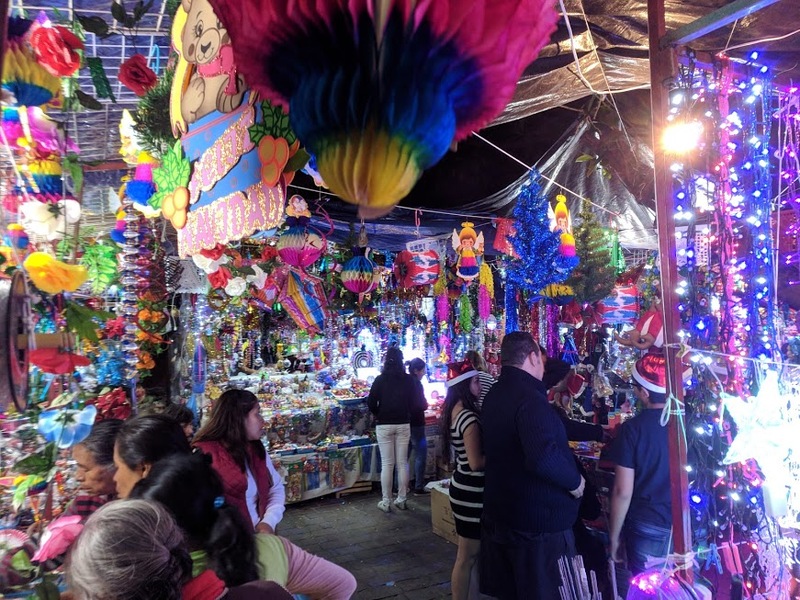 In addition to food stalls selling grilled corn on a stick, sweet cakes and breads, tacos, papas fritas, churros, and more, there were all kinds of crafts, pottery, leather, tupperware (I learned and interesting story about this I’ll share later), all sorts of Christmas gifts, just about anything you can imagine. I thought this was a special Christmas market, but it turns out this happens every day. Of course, it was all decorated for Christmas, so that part probably goes away soon. I found an ATM next to the zócalo and got some cash, and I bought some tacos that were tasty. It turns out, though, that the places in Seattle that sell authentic Mexican‐style tacos get it right. These are not your Taco Bell crap with ground beef and tomato and shredded iceberg lettuce and Monterrey Jack cheese in a crispy corn tortilla. Sorry I neglected to take a picture. But they are served on miniature flour tortillas and just a little asiago cheese, and there were bowls of salsa (one green, one red). They used (and reused) plastic plates, wrapping them in a fresh plastic baggie for each customer. Of course I couldn’t resist completing the meal with something sweet, so without knowing what it was, I asked a vendor to give me his “mas favorito.” I’m still not sure what it was, and it wasn’t fabulous, but it satisfied my sweet tooth. I was so enchanted wandering among the stalls and watching all the people that I didn’t want the night to end. But finally I decided to head home. Somehow, though, I got turned around and lost my bearings. I was pretty sure I was going the right direction, but I was on a different street from the one I’d come downhill on. Google Maps was little help because I didn’t have any phone or data service (it seems to come and go sporadically in this city). I figured as long as I headed uphill I’d be okay, but I finally went into a little grocery to ask for directions. Of course the shopkeeper didn’t speak English, and my Spanish was apparently unintelligible. So he called his son who supposedly speaks English, and his son arrived but didn’t say a word. I finally was able to bring up Google Maps and point to where I was going and figure out I was on the right path. There was still more uphill to go. Oh, also, did I mention the altitude? Even though Tepoztlan is in a valley, it’s more than a mile above sea level. So by the time I got back, I was panting for air. All in all, it was a great first night in Tepoztlan! Did I mention all the dogs in this city? Also, my hosts raise chickens. One of which is a rooster. Also, locals enjoy any occasion for shooting off fireworks. And apparently the night before Christmas even is such an occasion. And this goes on well into the early morning hours.